AAJ 2009 Annual Convention: New Speaker Added! Colson Hicks Eidson presents Marco Borges, world-renowned Exercise Physiologist. Borges has spent the past sixteen years teaching people how to lead healthier lives and achieve what they once thought impossible. His innovative, accessible, and highly effective approach to fitness has made him one of the most sought-after experts in the industry. His full-body transformative health programs have been successfully applied to everyone from severely obese individuals to top professional athletes, business moguls and entertainers. 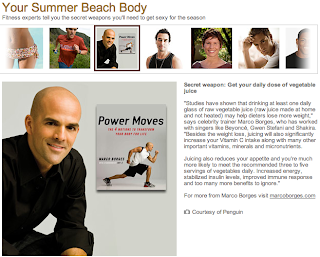 Marco writes a regular fitness column for the Miami Herald and has been featured in numerous other publications. He has developed extremely successful group fitness programs for both adults and children. Through his passion for people and communicating a healthy lifestyle, Marco continues to fight the obesity epidemic one person at a time. Event sponsored by Colson Hicks Eidson. Twice a year thousands of trial attorneys gather to discuss tools for their practice, strategies for the courtroom and the issues facing our nation....Join in on the conversation.